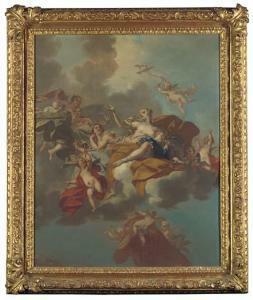 Find artworks, auction results, sale prices and pictures of Claudio Francesco Beaumont at auctions worldwide. 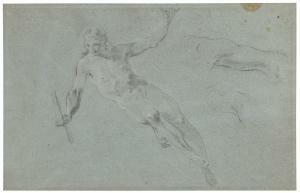 Claudio Francesco Beaumont STUDY OF A RECLINING MALE FIGURE AND TWO SUBSIDIARY STUDIES OF HIS LEFT ARM MONCALIERI 1694-1766 TORINO Black chalk, heightened with white chalk, on blue paper 308 by 482 mm Catalogue Note Whilst it has not been possible to securely connect the figure in this drawing to a painting by the Turinese artist Claudio Francesco Beaumont, its graphic style is highly consistent with that of other known drawings by the artist, similarly executed in a combination of black and white chalk on blue paper. 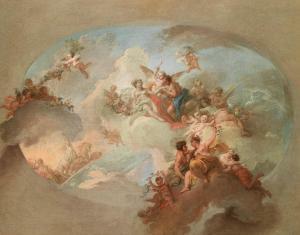 It has been suggested that the figure in the present lot may depict an Allegory of Painting and could have been incorporated into a decorative scheme with other Allegories of the Arts. We are grateful to Dr Arabella Cifani for identifying the present painting as Beaumont\’\’\’\’s work on the basis of photographs. A certificate by Dr Cifani is available for this painting. After a period of training in Turin, Claudio Francesco Beaumont travelled to Rome, where he copied the works of Raphael, the Carracci and Guido Reni. Upon his return to Turin, he worked in the service of the Savoyan court. He painted frescoes with allegorical and mythological subjects for the library and other apartments of the Palazzo Reale in Turin. An altarpiece by Beaumont depicting a Deposition from the Cross is preserved in the Chiesa di Santa Croce in Turin. Claudio Francesco Beaumont - Portait Of Charles Emanuel Iii, King Of Sardinia And Duke Of Savoy (1730-1773) In The Red Robe Of The "supreme Order Of The Most Holy Annunciation"
Portait of Charles Emanuel III, King of Sardinia and Duke of Savoy (1730-1773) in the red robe of the "Supreme Order of the most Holy Annunciation". Inscribed on an old label on the stretcher: "Opera di Claudio Francesco Beaumont Nato a Torino nel 1694 morte nel 1766. Celebre Pittore del Re di Sardegna Carlo Emanuele III". Charles Emanuel III introduced the red robe to the Knights. Charles Emanuel III, King of Sardinia and Duke of Savoy(1730-1773) in the red robe of the "Supreme Order of the most HolyAnnunciation". Inscribed on an oldlabel on the stretcher: "Opera di Claudio Francesco Beaumont Nato aTorino nel 1694 morte nel 1766. 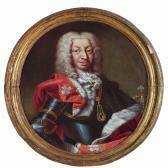 Celebre Pittore del Re diSardegna Carlo Emanuele III". Charles Emanuel III introduced the red robe to theKnights. 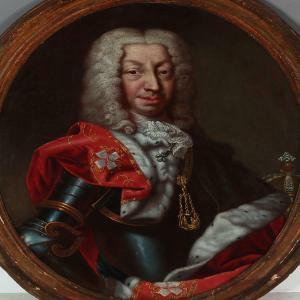 Although French by birth, Claudio Francesco Beaumont becameattached to the royal family of Savoy after securing the patronageof Vittore Amedeo II in Bologna in 1716. Vittore Amedeo sent him toRome to study with Franceso Trevisani and on his final return in1731 he was appointed court painter and entrusted with the mostimportant commissions, notably in the decoration of Palazzo Reale.On this he worked for much of his life, painting classicallyinspired frescoes deeply imbued with the work of SebastianoRicci. We are grateful to Professor Daniele Sanguineti for confirming theattribution on the basis of a photograph.